It has been a month since I decided to start a blog to journal my journey with Glioblastoma Multiforme after being inspired to do so on browsing through https://thebrainchancery.com/ - Chad Peacock's blog on similar lines. And it has been a week since I purchased the http://www.braincancerchronicle.com/ domain. I am making this far too difficult than it is. I have been very actively sharing about this journey so far on facebook/twitter. So I should just be able to pick a few posts from the past, collect them on one page, and call it a good summary of the story so far. Firstly the important question: What is this blog about? This blog - inspired by above mentioned The Brain Chancery - will be a journal of my journey with a terminal cancer - from diagnosis on November 14, 2016 to the very end, however and whenever it comes. Chad documents his nearly 6 years journey from diagnosis in April 2012 to his death in December 2017 at The Brain Chancery in great detail, with humor & grace. I hope my blog - and my journey- will be far far longer than his blog/journey : I hope to be around 20/30/40 years from now being seen as one among the many long-time Glioblastoma survivors. Next: Who is this blog for? I am the primary audience for this blog. Mainly because William Zinsser says in On Writing Well that all non-fiction writing comes out good if written keeping in mind oneself as the main audience. Secondly, this blog is my attempt at documenting many aspects of my life to leave as many breadcrumbs as possible for me to reclaim my life when my mental faculties start declining, which is a real and serious possibility with Glioblastoma. I could literally "lose my mind" with tumor recurrences causing me to lose vital brain functionality including memory, cognitive skills, etc. In this context, my inspiration is William Styron's Darkness Visible - A Memoir of Madness where he documents falling victim to crippling and almost suicidal depression, and how he begins the journey back to reclaiming his love of life on listening to a piece of classical music he loves. I hope I love enough things in life to never run out of "happiness triggers". The third reason I am the primary audience of this blog is for me to get my fears, worries, concerns, etc. around this terminal cancer out of my system so that it does not impede my life. In January this year, I have been guilty of letting this worry about "I am gonna die soon" take too much time away from my consulting work, thereby putting at risk my ability to pay my monthly bills. We don't want that to happen too often, do we? This blog will be a one-stop source of information for my family and friends and the wider community about my current state of affairs with respect to Glioblastoma, and about any important events coming up in the near future. ‘Cancerful™’ is a term I am borrowing from Chad Peacock's The Brain Chancery. I hope to document all of my efforts at beating/surviving Glioblastoma in detail and hope it will be helpful to others who are newly diagnosed with this deadly disease. Now that we have that out of the way, let's start on THE STORY SO FAR. The story starts on November 14, 2016 when I had a craniotomy to remove a size-able tumor in my brain. I got to know of it only on the next day when I woke up from the surgery. A bout of nausea and throwing up had got me to the hospital on November 13th. The doctors diagnosed a brain tumor early morning on November 14th, and went though with the surgery the same day. The surgery was deemed very successful as they were able to remove all visible parts of the tumor. 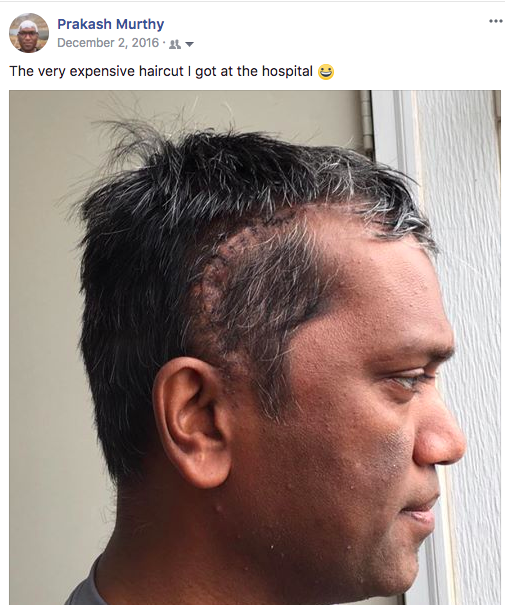 As I slowly realized what I had been through, and learnt more about how many things could have gone wrong with a brain surgery, I was filled with gratitude for coming out on the other side with nary a side-effect from such a complex medical procedure. The only side effect seems to be that I had lost the memory of a few events leading up to the surgery. Not a bad bargain at all. In addition, I got to know of the horrible thing only after I had been through the worse parts. Even now, I consider myself very lucky in this whole ordeal. 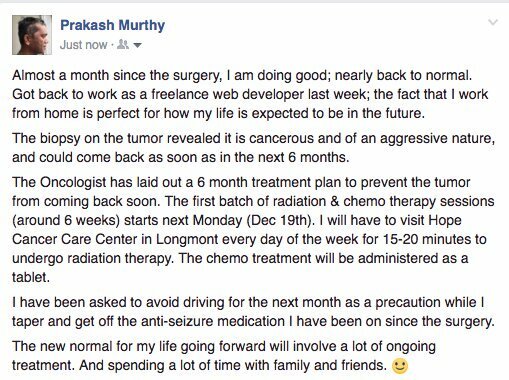 A month later - on 12 December 2016 - I learn that what I have is a Terminal Cancer. I AM GONNA DIE SOON. HELP!!!!!!!!! When I left the hospital after the surgery, the discharge papers they gave me said my tumor was of a benign nature, so it was with a sense of relief that I went home. I totally did not understand why I was being asked to see an Oncologist a month later. Got to know from the Oncologist that my tumor was cancerous and that I should undergo treatments for a long period of time to deal with it. Reading about Glioblastoma online is an exercise inviting depression and suicidal tendencies. From the wikipedia page : The most common length of survival following diagnosis is 12 to 15 months, with fewer than 3% to 5% of people surviving longer than five years. I started on the 6 week Chemotherapy & Radiation therapy treatments on December 20, 2016, and completed it on January 31, 2017. After a one month break, I started on the 5/23 Chemotherapy treatment (5 days of higher dose chemotherapy treatment in a 28 day cycle) on March 1st, 2017. Started on the Electric Field Therapy treatment with Optune device on the same day. Finished the 5/23 Chemotherapy treatment after 6 cycles in July. Continued with the Optune treatment beyond the Oncologist recommended 6-months since I see it as a big hope in preventing a tumor recurrence. Got to know about Chad Peacock and his death through his blogpost on January 3, 2018 on the same day the blogpost was published. This turned out in retrospect to be the most significant thing to happen in my journey with Glioblastoma so far, as it blew away my false confidence that I will survive Glioblastoma because of my relatively young age, a belief encouraged by many in the medical profession stating that my youth works in my favor. The sense of hopelessness engendered by the above event played a big part in me experiencing my first seizure on January 11, 2018. Contrary to our fears, it did not turn out to be caused by a tumor recurrence. Big relief! Ever since the seizure and the realization that depending only on conventional FDA approved treatments for Glioblastoma is a recipe for early death, I have been reading up on Anti-Cancer life-style, Anti-Cancer diet, etc., and making changes where possible without impacting the regular treatment plans that my medical team recommends. That is where I am now. More about some of the items I skimmed over towards the end in future blogposts. See you with a new blogpost sometime soon. I am here, Prakash. I see you and love you. Great post Prakash. It's admirable to put it all out there with good humor and a positive attitude. You have been an absolute inspiration for me and many others in the community. I have not been in touch and am just finding about this. I still have the flash drive you had gifted me during Bangalore RubyConf. I love your leadership and encouraging attitude. Thanks for touching our lives with your positivity. I'm sure you'll continue doing so for a long time. I'm thinking about you in Australia! I miss seeing you and wish we could go for a run together. As our summer starts to wind down I hope spring is coming soon for you. Prakash, I love this! We've connected a little on facebook. I also blog: jessicamorrisnyc.wordpress.com Let's follow each other. Cheers!